Oh, rejection… We’ve all been there. From the minor everyday letdowns of our social media posts remaining unliked to the major devastations of not getting into our preferred school, rejection is a very real component of the student experience. In his TED Talk on emotional pain, psychologist Guy Winch refers to rejection as a “psychological wound,” and it really does feel this way sometimes. Winch writes, “Rejection destabilizes our need to belong, leaving us feeling unsettled and socially untethered.” Yes, it’s normal and happens to everyone, but in that moment, it can be difficult to keep things in perspective. We have a tendency to withdraw to protect ourselves. In internships, in graduate school admissions and especially in student activities. We slap on the Penn Face and pretend rejection doesn’t happen, or at least it doesn’t happen to us. She calls for an increased culture of openness at Penn in which to discuss and destigmatize rejection. To help facilitate this process, she and other fellow student leaders recently created Penn’s first Wall of Rejection. The student-managed exhibit sponsored by the Office of Student Affairs was hosted by WIC and students contributed items from April 25th to the 29th. The Weingarten Learning Resources Center (VPUL) is a partner in the soon-to-be-launched PennFaces website that will feature interviews with the Penn Wall student organizers. The entire Penn community was encouraged to come and share their rejection stories on the wall by filling out a notecard and having a polaroid photo taken. Penn Benjamin’s Peer Counseling also shares this attitude and provides undergraduate students with in-person peer counseling as part of WIC’s Student Assistance Services. The Penn Wall of Rejection is in good company. A few weeks ago, Princeton professor Johannes Haushofer’s CV of failures made headlines. Well-known author J.K. Rowling also recently shared two of her rejection letters on Twitter to inspire future writers. The Wall of Rejection is on display at WIC until commencement, and many members of the Penn community have participated–including myself! Brown intends to hold the event again next year and hopes that a broader collective of Penn students will contribute their rejection experiences. Learn to Transcribe and Encode Early English Books! 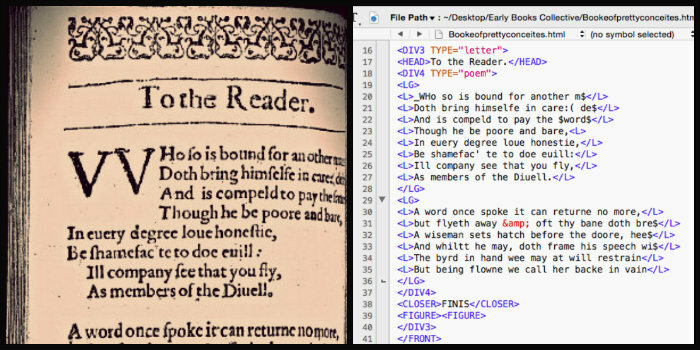 Are you interested in early modern texts and learning more about the digital humanities? 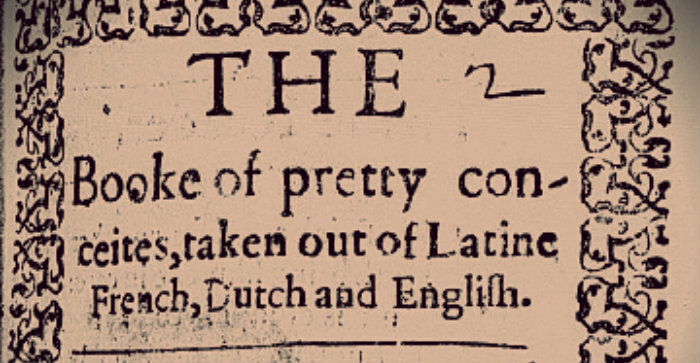 The Early Books Collective is once again looking for undergraduate students and all interested parties to collaborate with us in transcribing the 17th century text: The Booke of Pretty Conceites–very merry, and very pleasant, and good, to be read of all such as doe delight in new and merry conceites. Join us every Wednesday from 4 to 5 p.m. in the Vitale II Media Lab, Kislak Center, 6th Floor, Van Pelt Library. No registration necessary. Working with the Early English Books Online (the EEBO database) Text Creation Partnership (TCP), you’ll decipher and transcribe this text by learning the TEI encoding language and, thereby, cultivate a valuable skill for work in the digital humanities. Upon completion, we will be contributing our transcribed text back to the EEBO database and the Text Creation Partnership, which is fully and freely available for anyone to use. Experience firsthand how early books are digitized! Join us in contributing to this important project of creating an invaluable scholarly tool!